Warren’s focus on the structural problems with the American economy staked out a clear line dividing the moderate and progressive wings of the Democratic party. If you want to understand the coming intra-party battles on economic issues between progressive Democrats and their moderate colleagues—which will no doubt bleed into the 2016 Democratic presidential primary—Senator Elizabeth Warren’s keynote speech to an AFL-CIO conference on Wednesday might be your best blueprint. Obama’s economic message, in short: everything’s going great. It is this argument that Warren took singular aim at Wednesday. Warren politely agreed with the broad points, and gave the Obama administration “credit for the steps they’ve taken to get us here.” Then she went on to dismantle the article’s entire premise. “Despite these cheery numbers, America’s middle class is in deep trouble,” she said. She cited familiar stats about how wages flattened out in the early 1980s while profits grew, and that expenses grew as well: she noted Americans are paying far more for mortgages, health insurance and tuition than they did thirty years ago. Warren described how quite literally 100 percent of the income gains in the past thirty-two years went to the top 10 percent of earners. No doubt Obama agrees with much of that analysis—and has voiced it himself at various times. 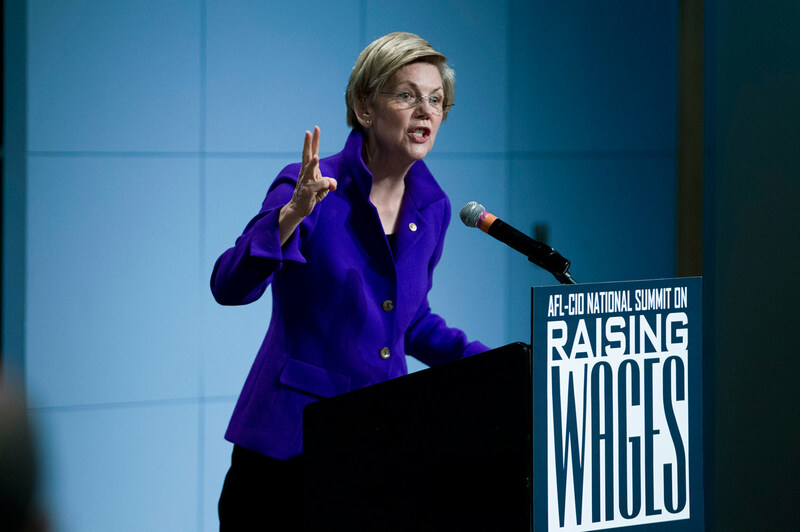 But he either doesn’t agree with, or expends no energy undertaking, some of Warren’s solutions to structural problems: like, say, breaking up the big banks, which Warren expressly advocated in her speech Wednesday. Warren also has spent a lot of time raising concerns about the Trans-Pacific Partnership trade deal in recent months, and referred Wednesday to “trade pacts and tax deals that let subsidized manufacturers around the globe sell here in America while good American jobs get shipped overseas.” Obama, of course, is pushing hard for TPP to be fast-tracked. These specific policy disagreements between Warren and Obama—and between many progressive and moderate Democrats more broadly—are best explained by the philosophical difference Warren tried to outline in Wednesday’s speech. If you believe the economy is basically doing fine, you’re less likely to want to rock the boat policy-wise. You’ll push for some nice things like increasing the minimum wage, but nothing enormous. Things are good! But if you believe, as Warren and many of her progressive allies in Congress do, that the game is fundamentally rigged, the rhetorical and substantive response to economic problems is much different. We’ve seen this difference play out in small skirmishes already. Warren led an unsuccessful charge against relaxing a substantial Dodd-Frank rule during the year-end appropriations process—a measure backed by Democratic leadership in the Senate and not deemed veto-worthy by Obama. Right now, a House bill to delay the Volcker Rule is being backed by House minority whip Steny Hoyer. These are fundamentally fights about how much power Wall Street should be allowed to have, and the government’s role in checking it. As Greg Sargent writes today, Democrats are also gearing up for a big fight over executive action on overtime rules that could benefit millions of salaried American workers. Progressives are pushing for an income threshold of $51,000 (or higher) under which one qualifies for time-and-a-half past forty hours, but there is increasing concern Obama wants to set it much lower. Once again, your opinion on the threshold might center, at least in part, over how bad you think the economic picture is for middle-class Americans, and how much political capital ought to be extended to change it. Beyond these fights, the 2016 Democratic presidential primary will no doubt serve as an arena to litigate this fundamental difference among Democrats. If you want to see Warren’s speech as a step towards that arena, you are free to do so—The Wall Street Journal noted four different times in her remarks that Warren was indirectly criticizing the Clintons and even Hillary herself. But even if she doesn’t run, Warren is making the battle lines clear.